Thermal coal is a type of bituminous coal which is used to provide heat energy in combustion in various types of furnaces via the pulverized fuel method because of its high calorific value (CV). It is also sometimes called as non-coking coal, steam coal, or boiler coal. It includes all those bituminous coals which are not included under coking coal category. It is characterized by higher volatile matter (VM) than anthracite (more than 10 %) and lower carbon (C) content (less than 90 % fixed C). Its gross CV is greater than 5700 kcal/kg on an ash?free but moist basis. The greatest use of thermal coal is for the generation of steam in the boilers for the purpose of generation of electricity. Thermal coal is also used in some of the processes for ironmaking especially in the production of direct reduced iron (DRI) and in the smelting reduction processes for the production of hot metal (HM). Thermal coal is a complex heterogeneous substance. Hence, it has no fixed chemical formula. Its characteristics and hence its CV vary widely. Thermal coals like other coals also contain carbon (C), oxygen (O2), and hydrogen (H2). The other constituents in thermal coals include sulphur (S), nitrogen (N2), ash, chlorine (Cl), and sodium (Na). The quality of thermal of coals is based on the amount of C, O2, and H2 present in coal. The metallic elements in the thermal coal contribute to the coal ash. The chemical structure of the organic molecules of the thermal coal is very complex and is dependent on the rank of the coal. It varies from one coal to another coal. 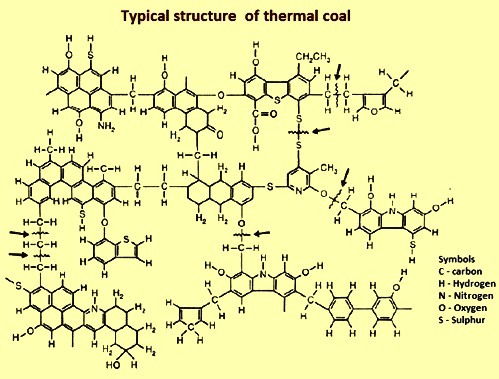 Typical structure of thermal coal is given in Fig 1. The performance of the thermal coal in a furnace is influenced by its properties. Coal quality has an impact on many parts of the combustion system of the furnace including the coal handling facilities, pulverizing mills, furnace proper, air pre-heating system, pollution control devices, ash disposal system as well as stack emissions. Thermal coals have different characteristics and heat content. The major contributor to differences in thermal coal properties is the presence of the mineral matter and other impurities, alongside the reactivity of the coal which is broadly associated with its rank. The behaviour of the thermal coal in a furnace is strongly influenced by its rank and by the mineral matter and other impurities associated with it, both in terms of how much ash forming material is there, and its composition. The mineral matter can form slagging deposits in the hotter parts of the furnaces and cause fouling deposits in the flue gas passages. Coal properties can affect the efficiency, reliability and availability of both the furnace and the pollution control devices which clean the flue gases before discharge. Specially, coal quality impacts the coal consumption, operating and maintenance costs of the furnaces as well as the waste disposal costs. The value of the thermal coal is largely dependent on its various properties. The properties affect both the economics of the operation as well as the short and long term operation of the furnace. The beneficial properties result into cost savings while the detrimental coal properties results into cost increases. The cost of thermal coal is usually directly linked to its heating value, which is more or less equivalent to the coal’s energy content. Determining the correct heating value becomes an important commercial issue and implicitly affects the economical operation of the furnace. The heating value of thermal coal depends on the combustible matter, mainly C and H2 in the coal and how it reacts during the combustion process. Apart from combustible matter the other main ingredients which affect furnace efficiency are the ash, VM, and moisture contents. The ultimate analysis indicates the percentages of various elemental chemical constituents (such as C, H2, O2, S, N2, and Cl etc.) in thermal coal. The ultimate analysis is useful in determining the quantity of air needed for combustion and volume and composition of combustion gases. This information is required for calculation of flame temperature and flue gas duct design. Different sources of thermal coal have different constituents in the coal. Even coal from the same mine at different seams has got different constituents. Every constituent has got different impact on coal combustion as such it is very important to know them in detail. S content in the thermal coal affects clinkering and slagging tendencies, corrodes chimney and other equipment and limits flue gas exit temperature. The proximate analysis of thermal coal determines the percentage of fixed C, VM, moisture and ash in it. The various parameters of proximate coal analysis in case of thermal coal have considerable significance. Fixed C acts as a main heat generator during burning and it gives a rough estimate of heating value of coal. The VM also contributes to the heating value of coal. Increase in percentage of VM in coal proportionately increases flame length and helps in easier ignition of the coal. It has also have implications regarding minimum limit of furnace height and volume and influences secondary oil support. Ash is an impurity which does not burn. It is important parameter in design of furnace grate, combustion volume, pollution control devices and ash handling plant. Ash increases transportation, handling, storage cost of the coal and affects the combustion efficiency and the furnace efficiency. It also causes clinkering and slagging problems in the furnace. Moisture increases transportation, handling, storage cost and decreases the heat content per kilogram of coal. It increases heat loss due to evaporation and superheating of vapour Moisture helps in binding of the fines and in radiation heat transfer. The moisture is in two forms namely (i) the inherent moisture which is entrapped within the structure of the coal, and (ii) the moisture exogenous to the coal’s structure. Part of this moisture can evaporate under normal atmospheric conditions during its transportation and storage of the coal before its use. The amount of moisture determines how much heating is required to dry the coal before it is consumed. Moisture in coal is expressed as proportion of total weight so the change in the moisture content changes the proportion of the other coal constituents and importantly, the CV. VM content of the thermal coal is critical both for its use in furnace as well as in ironmaking, since this determines the burn rate of the coal. Coals with high VM content, while easy to ignite often are not as preferred as compared to the coals with moderately VM content. Coal with low VM content may be difficult to ignite although it contains more energy per unit volume. The user of the coal is to balance the VM content of the coal to optimize the ease of ignition, burn rate, and energy output of the coal. Ash is the residue remaining after the combustion of coal organic matter and oxidation of the mineral matter present. Ash is therefore the incombustible material and is measured as a percentage of the air dried coal sample. Higher ash content implies both higher transport and handling costs per unit of energy and it is a waste which, in general, requires disposal. CV of the thermal coal is the amount of potential energy in coal which can be converted into actual heating ability. It indicates the amount of heat which is released when the coal is burned. The CV varies by geological age, formation, ranking and source of the coal. CV value is expressed in two different ways on account of the moisture in the coal. Gross CV (GCV) is the total heat released when burning coal while Net CV (NCV) is the heat energy available after eliminating the loss due to moisture. GCV is also known as high heating value (HHV) while the NCV is also known as low heating value (LHV). The relationship between NCV and GCV at constant volume is given by the equation NCV = (GCV – 0.206H)*[(100-TM)/(100-IM)] – 0.023TM. In the equation H is the percentage of H2, TM is the percentage of total moisture and IM is the percentage of inherent moisture or air-dried moisture. Both NCV and GCV are expressed in kilocalories per kilogram (kcal/kg). Relationship between GCV and NCV based on the ultimate analysis is given by the equation ‘NCV in kcal/kg = GCV – 50.6*%H – 5.85*%M – 0.191*%O where H, M, O are the values of H2, moisture, and O2 of the coal. The CV of the coal can be determined either by calculation from chemical analysis or by burning a sample in calorimeter. CV obtained by a calorimeter is the GCV. Calculation of CV of coal based on proximate analysis gives very rough estimate of the CV of the coal and is generally used for deciding the grade of coal and the usual formula adopted for this is ‘useful heat value of coal in kcal/kg = 8900 – 138*(M + A)’ where M is the percentage of moisture content and A is the percentage of ash content. Ultimate analysis gives fairly correct CV of the thermal coal and formula to be used for this is ‘GCV of coal in kcal/kg = (355*% C + 1148*%H + 95*% S – 145*% O)/4.1868’. C, H, S, O are the percentage figures obtained in the ultimate analysis of coal for C, H2, S, and O2. When coal burns the moisture in the coal evaporates taking away some heat of combustion which is not available to the furnace for heating. The CV determined by calorimeter is higher than that obtainable under most working conditions in a furnace by an amount equal to the latent heat of vaporization of water. In general terms the higher the CV of the coal, the lesser the amount of coal required in the furnace. Higher CV also generally implies higher costs for the thermal coal due to greater washing and other processing by the coal producer. This cost tends to be offset by lower costs of logistics, storage and ash disposal. Other important properties of thermal coal are the grindability of the coal, ignition temperature, and the ash fusion temperature (AFT). Thermal coals are subjected to grinding before firing into a furnace. The grindability of coal refers to its behaviour during the coal grinding. There is substantial cost attached to the coal grinding. It is measured by Hardgrove Grinding Index (HGI). Grindability is an index and therefore, it has no unit. HGI is a measure for the grindability of coal and is traditionally used to predict the capacity, performance and energy requirement of pulverizers, as well as determining the particle size of the grind produced. The smaller the HGI, the harder is coal texture and less grindable is the coal. Conversely, the higher the HGI, the easier the coal is to grind, with consequent lower power consumption and higher throughput of coal in the pulverizer. The resultant size distribution of the coal can affect its combustibility and coal handleability in the bins and transfer lines. Soft coals can produce a high proportion of fines, whilst hard (low HGI) coals are difficult to grind, leads to increased operating and maintenance costs. Ignition point of coals is that temperature at which the coal combusts. Coals having low ignition points are unsafe for long storage and pulverizing. Ash fusion temperature is most widely used to evaluate the slagging tendency during coal combustion. The ash fusion test is performed in a reducing atmosphere and helps assess the combined effect the ash forming minerals have on ash softening properties at different temperature levels. Higher levels of AFT prevent ash from depositing on the furnace floor and walls. Emissions from coal combustion depend on the rank and composition of the fuel, the type and size of the furnace, firing conditions, load, type of control technologies, and the level of equipment maintenance. The major pollutants of concern from thermal coal combustion are particulate matter (PM), sulphur oxides (SOx), and nitrogen oxides (NOx). Some unburned combustibles, including carbon monoxide (CO) and numerous organic compounds, are generally emitted even under proper furnace operating conditions.